The fifth largest global tire maker by sales, Pirelli is leader in the premium segments with high technological content. The Company has 19 factories throughout the world, on four continents, and operates in more than 160 countries. Founded in 1872 and listed on Milan Stock Exchange since 1922, Pirelli is distinguished by its long industrial tradition, which has always combined a capacity for innovation with product quality and brand strength. In line with its ‘green performance’ strategy, Pirelli – always focused on research and development – operates with ever increasing attention to products and services of high quality and technology and low environmental impact. 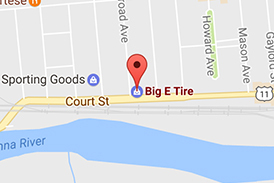 Get A Quote Today on Pirelli Tires at Big E Tire and Auto – Browse Pirelli Tires Now!